An exciting new concept has hit toy stores this week, and I have mixed feelings about it. 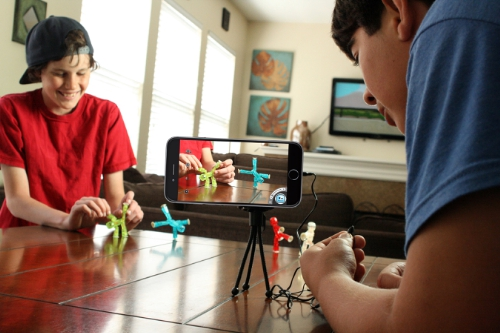 Stikbot is a cool idea–an action figure that’s tailor-made for stop-motion animation. However, it’s practically necessary to have a smartphone to play with it to its fullest extent. There’s also a heavy element of social media in the marketing, which means that they’re either going to forego the younger audience, or that we’ve given up on the idea of keeping children off of social media. The toymaker, Zing, has previously been known for their outdoor active play toys, so this is a whole new arena for them. 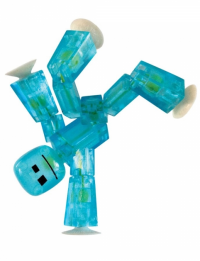 It’s an action figure, with suckers on its hands and feet, designed for stop-motion animation. These are translucent little guys with simple features who should appeal to the Minecraft crowd, but also attract fans of older toy lines like Micronauts. Unfortunately, as I mentioned, all the software (and hardware) that’s required for this is smartphone-based. The slant of the marketing is for you to make short video clips that you then upload and share with your friends. On the plus side, they may sell millions of the “Studio” sets, because folks will buy them just to get the inexpensive iPhone tripod. An easy-to-pose figure with suction cup hands and feet that adheres to almost any flat surface. Download to users’ camera roll and an easy upload to social media. 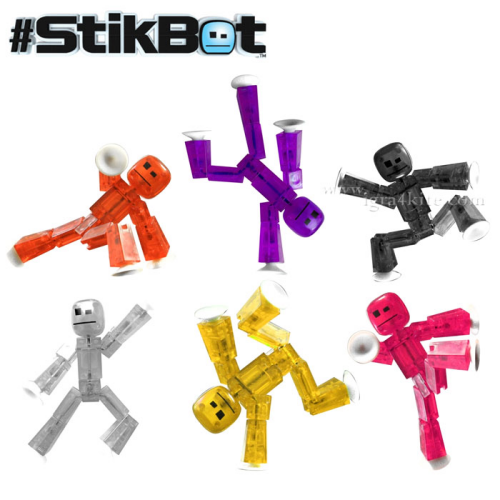 Stikbot is available in a studio pack, including 2 Stikbot figures and a tripod ($9.99 retail), and a single pack, including one figure ($4.99 retail) with 7 different color options. They can be found at Amazon.com, Fred Meyer, K-Mart, Target, Toys R Us, Walmart and Zing’s online shop. Like I said, I have mixed feelings about this. I love the idea of action figures that are intended for stop-motion animation. I just wish–and this is probably a generational thing–that it didn’t require a smartphone to use these. It’s a cool idea and a neat-looking figure, so I’ll probably pick some up to review, but I think with the requirement of expensive smartphones and the social media aspect, this may wind up being a toy aimed more at young adults than children. And if that happens, they might as well explore their licensing options, because if they go into that area, this concept could be a goldmine. Imagine being able to make your own Star Wars, Hobbit, or Monty Python clips.